Nov 14, 2015 (LBO) – Some equities offer dividend returns as well as earnings growth. Called Gary stocks, these are an attractive value proposition in an Asian context, Desh Peramunetilleke, the head of microstrategy for Asian brokerage and investment firm CLSA, said. “The growth at a reasonable yield, Gary strategy, has delivered strong returns globally,” he said. Asian companies, including several Sri Lankan equity picks, qualify based on market capitalization, consistent dividend payout and return on capital employed, he said speaking to investors at a CT CLSA presentation in Colombo. Explaining the valuation, Peramunetilleke noted that bond proxies are defensive stocks with higher yield but lower growth compared to Gary stocks that offer growth at a reasonable yield. 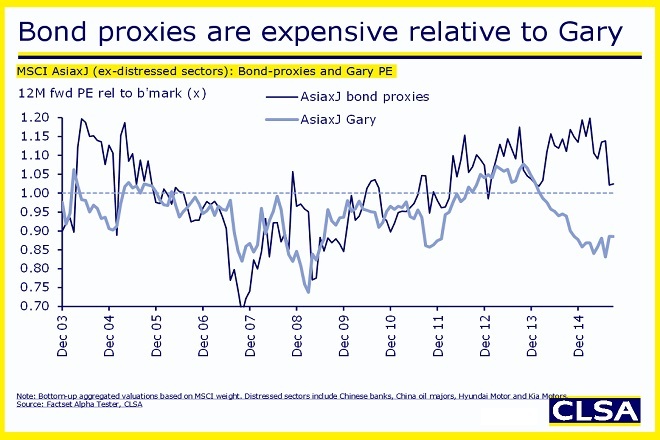 Bond proxies are currently expensive in comparison, he said. Despite uncertainty in international markets, and tepid growth in China, Asian stocks offer value based on several such criteria. Asia ex-Japan has an attractive trailing PE of 12.3, and price to book value of 1.39, based on the MSCI. Averaging around five percent economic growth in recent years, Asia has consistently outpaced the rest of the world, he added. Fundamentals in the region are also improving in terms of Ebitda margins, net debt to equity, cash to assets and capital intensity. This had led to a better culture of paying out dividends. “The increase in number of companies paying dividend within Asia ex-JP augurs well for future dividend contribution to total returns,” he said. More dividend fund inflows to Asia have been recorded, while emerging markets have recorded dividend fund inflows despite an equity fund outflow in recent years. 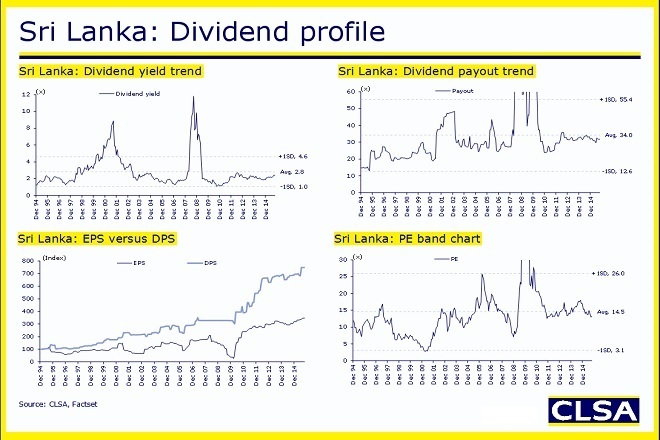 Dividends contributed 52 percent of total returns over the past 10 years in the case of Sri Lanka. After ending a war with Tamil Tiger separatists in 2009, the island is experiencing a tourism influx and more foreign direct investment. Economic growth is expected to average over six percent, and the market is valued at a trailing PE of 13.2 and a price to book value of 1.65. The Colombo Stock Exchange (CSE) has 294 companies valued at 21.3 billion dollars. 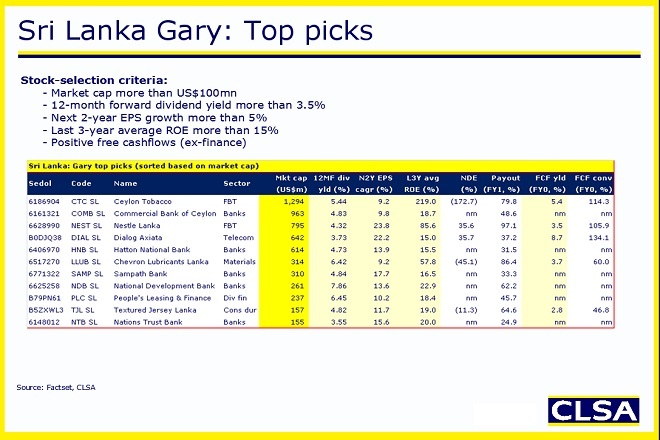 Based on a Gary selection criteria of market cap over 100 million dollars and dividend yield of more than 3.5 percent including earnings growth, CLSA’s top pick for Sri Lanka is Ceylon Tobacco. With a market cap of 1.29 billion dollars, or 6.6 percent of the total market cap, Ceylon Tobacco is the second biggest listed on the CSE. Selection criteria includes expected EPS growth of more than 5 percent over the next two years, average ROE more than 15 percent over the last three years, and positive free cashflows (ex finance), he said.